Our company holds vast experience in this domain and is involved in offering Natural Rubble Stone. Rubble is broken stone, of irregular size, shape and texture; undressed especially as a filling-in. Rubble naturally found in the soil is known also as 'brash' (compare cornbrash). Where present, it becomes more noticeable when the land is ploughed or worked. Keeping in sync with the modern trends of the industry, we are readily betrothed in offering an excellent quality collection of Dolomite Rubble within the committed period of time. - Rubble is manually broken stone and is a non uniform shape that available in size of 250 mm to 300 mm (10 to 12) or size as per client requirement. 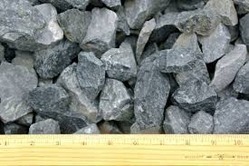 - Machine crushed rubble is also available having size of 0 to 150 mm or as per client requirement. Now what is mostly left is stones and rubbles which can be further made to interlocking pavers or bricks or can be used in covering low lying areas.